If a monster is Normal or Special Summoned to a zone a Link Monster points to (except during the Damage Step): You can Special Summon this card from your GY (if it was there when the Summon resolved) or hand (even if not), but banish it when it leaves the field. You can only use this effect of “Sea Archiver” once per turn. Sea Archiver is a Level 3 with high DEF (2100 is fantastic) and a nice Special Summon ability. While you can use it normally as a Set/Special Summon/Normal Summon, Archiver can Special Summon itself once if a monster gets summoned to a link zone. On your turn this adds another monster for you to use for Xyz, Synchro, or Linking. On your opponents turn this puts a monster on your field that could be a wall against certain monsters. Once per turn and banish when it leaves the field are good balances. Oddly enough it is a WATER Attribute but a Cyberse monster. With Invoker needing Level 3’s this card has some play with that, and with the spam-linking in the game currently it shouldn’t be hard to get this little one on the field. It’s a decent monster to use as a spam monster to encourage more Link Summoning, but you only get that Special Summon once, and it takes up a slot in your deck that may serve better for a different card. A very balanced card today. Sea Archiver is a Level 3 Water Cyberse-type monster with 300 Atk and 2100 Def. The stats that matter here are Cyberse and that nice 2100 Def. I really like how the effect works. If Sea Archiver is in your hand or grave, it will Special Summon itself after a monster is Normal or Special Summoned to a zone a Link Monster points to. It banishes itself when it leaves the field after that effect. It’s also a hard once per turn if banishing is off the table for some reason or if you happen to have multiples. This is what happens after years of thinking about Treeborn Frog. Now we have a good way to utilize a good effect without worrying about loops. I particularly enjoy the fact that this can be used during either player’s turn and in response to any Normal or Special Summoning. Sea Archiver also gets points for its splashability (pun intended) in other decks that link summon (read: every meta deck). I’m glad to sea it. We continue this Cyberse themed week with a card meant to give you another Link Material, Sea Archiver. Sea Archiver is a Level 3 WATER Cyberse with 300 ATK and 2100 DEF. ATK is poor, but it makes up for in great DEF. WATER is a solid type and again, Cyberse will be highly supported for a while. If a monster is summoned to a zone a Link Monster points to while this card is in the hand or GY, you can Special Summon this card from where it was at, but it is banished when it leaves the field, and this is a hard once per turn so you can’t use multiple Sea Archivers. You are likely going to put this in the GY first somehow for maximum optimization for this card when it comes to generating advantage. Probably Normal Summon this card or Special Summon it via other ways and then Link away with this, then summon a monster to a zone the Link Monster points to and use Sea Archiver for another Link. 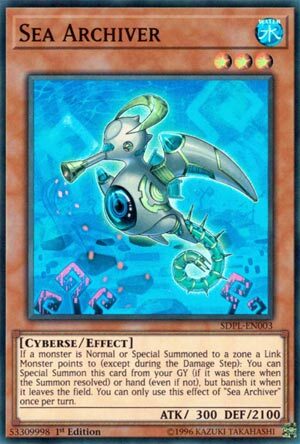 This is a nice extender for the Cyberse deck for your Link plays and is worth playing 2 or 3 copies of to get multiple Link monsters out or just bigger Link monsters in general. Art: 4/5 Cute little machine sea horse. Sea Archiver may strike you as one of the Monsters that is simple, but it is anything but. Okay, let’s look real quick and see the 2100 defense on this Level 3 Monsters, and admire it. This card has lots of versatility, being able to be Special Summoned from your Graveyard, or Hand, if a Monster is Normal or Special Summoned to a Link Zone. This can’t happen during the Damage Step, but it can be triggered by either player. So the use of this card only floats upward. (That was a silly attempt at humor). This can only be done once per turn, so you can’t gain a mass advantage or use multiples of this, but that’s appropriate. See Archiver is also removed from play when it leaves the Field, which prevents abuse of a good card, so I’m fine with that too. It’s a nice little weapon for Cyberese, and certainly should assist in your Link Summoning as well. Art: 4/5 Cute but dangerous, no?